Hello, friends, and welcome back for another set of reviews about Ed McBain’s 87th Precinct series. 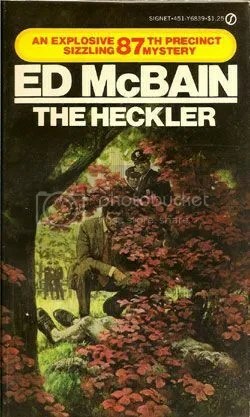 In the first installment of “All McBain, All the Time,” I offered a brief introduction as to why I enjoy the author’s writing, then followed that up by reviewing three of the 87th Precinct books. If you’d like to see that piece, please click here or feel free to navigate through the site by using the search function or perusing the “Reviews” category on the side panel. Let’s get right to it then, shall we? 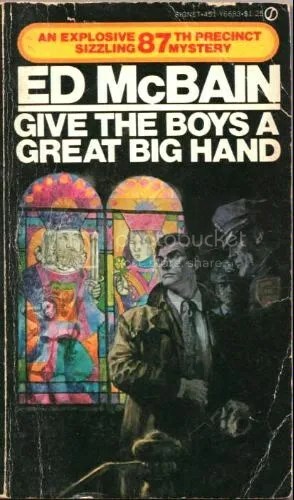 This book begins with one of the darker premises of the early novels: a police officer finds a travel bag with a severed hand in it. The discovery kicks off a lengthy investigation as Detectives Carella and Hawes try to track down information about both the victim and the assailant. The case is one of the more realistic ones in the series in that it highlights not only the difficulty in finding clues, but also the frustration when many of them lead to dead ends. I find it difficult to score this one, mainly because there are a ton of asides that don’t relate to the case. That being said, the tangents prove to be well-written and entertaining. I’ve always considered McBain’s use of description and personification to be almost lyrical in nature. It’s enjoyable to read long passages about such diverse topics as the rainy weather, the way McBain likened the city to a woman, a fight that broke out in the squad room due to racial insensitivity, and the difficulties Carella’s wife had while raising her twin babies. However, as good as these passages were, they really didn’t have much to do with the overall story. Looking at the tale as whole, I don’t think the actual investigation took up even half of the book. As such, I waffle between a 7 and an 8 for the score, so I’ll split the difference and give it a 7.5 out of 10. It’s still a good book, and I recommend reading it, but readers should know going into it that the dark storyline takes a backseat much of the time. Before getting into the review, the book’s title hearkens back to the plain names of earlier books – The Pusher, The Con Man, The Mugger, etc. A book’s title shouldn’t be important enough to comment on, except a) the previous title’s use of double entendre was pitch perfect, and b) The Heckler is a bit of a misnomer in this case. The novel would have been better served with a title like The Caller, The Bully, The Terrorist, or some form thereof. I’ll preface the following passages about The Heckler by stating that they have some spoilers in them. I hate to write a review that gives certain things away, but in this case it’s almost impossible to avoid. The spoilers aren’t major, but if you want to go into the book blind, you may want to skip this. The Heckler opens with two separate cases: first, a naked body is found in the park, dead from a shotgun blast to the chest; second, numerous businesses in the 87th Precinct have been receiving threatening phone calls, urging store owners to move out of their establishments if they don’t want to be physically harmed. Initially the police think the caller may be a prankster, but as the calls increase in frequency and the recipients become more fearful, the detectives are forced to find the source of the threats. The Heckler introduces a character known only as The Deaf Man, a criminal mastermind who is working a complex scheme akin to the heists seen in Ocean’s Eleven or The Italian Job. From the get-go we see that The Deaf Man is a force to be reckoned with, not because of brute strength or an imposing nature, but because of his cold, calculating mind. The Deaf Man is extremely confident in his ability to not only outwit the police, but also account for every detail related to his heist, whether it’s the preparation leading up to the crime or the way he’ll evade detection once it is committed. However, as is the case with people who hold themselves in such high regard, he ultimately makes the smallest mistake, which brings his plan crashing down around him. While the The Deaf Man is obviously a sociopath, unlikable in almost every way, he breathes fresh life into McBain’s world. Never before has a villain bled over into other books in the series, giving the 87th Precinct a Lex Luthor-like menace it will deal with multiple times down the road. It’s a new plot device that should make for exciting storytelling in the future, pitting the bad guy against the detectives and seeing who comes out on top. I liked The Heckler. A lot. While I’ve spoiled that The Deaf Man makes his escape before the noose cinches tight, it’s the entire story leading up to the finale that makes this tale such a barn burner. Murder, mayhem, a complex heist, terrorism, fearmongering: this is McBain coming into his own with the series, pulling off one helluva great story. It’s rare that I give perfect scores, but I’d be hard-pressed to come up with anything negative to say about The Heckler (other than that shoddy title, of course). I believe I scored The Con Man and Lady Killer as my previous favorites, putting them somewhere in the 8-9 range. But, as good as those stories are, this book is even better. So I say “to hell with it,” and give The Heckler a 10 out of 10. Don’t worry about knowing The Deaf Man gets away. The lead-up is so damned good you won’t care if you know that tidbit. I won’t be writing much about See Them Die because I read it years ago and didn’t want to do a reread. However, I remember thoroughly enjoying this tale because it goes into detail about rival gangs in the city, as well as the manhunt for a criminal that has become Isola’s Most Wanted. Filled with action, gunfights, and (if my memory serves me) injuries/casualties sustained by the detective squad, this is another exciting addition to the series. I gave it an 8 out of 10 at the time, and included it in my Ten Favorite Books the year I read it. There you have it, folks. While some of the earlier books ran hot and cold for me, we’re starting to see that any book in the 87th Precinct series – even the ones that score a little lower than others – are still worthwhile reads that will always be entertaining. Readers who enjoy police procedurals will find it difficult to locate more consistently enjoyable tales than these. So what are you waiting for? 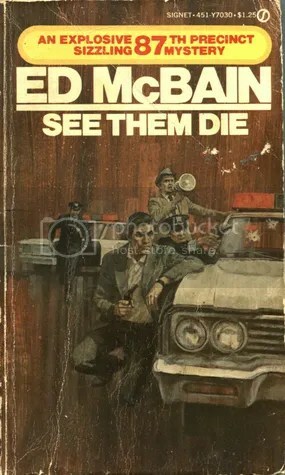 Stop reading my blathering and start following the masterful storyteller that is Ed McBain.